We knew it was coming, but it still stings. HP today announced and unveiled at MWC in Barcelona their reentry into the tablet market with the HP Slate 7 tablet. The seven-inch tablet has a 1024x600 screen, a 1.6GHz Cortex A9 processor, 1GB of RAM, and a meager 8GB of onboard storage (though it may be augmented by an included microSD slot). And, in typical HP fashion, it also includes Beats Audio integration and an HP ePrint application. The kicker: it runs Android. And not even the latest version of Android, no, it runs Android 4.1.1, and almost entirely unmodified from stock - the ePrint integration is an app - not the newer Android 4.2 that's been in the public since November 2012 (4.1.1 landed two months earlier than that). The Slate 7 also has no integrated GPS, no NFC, and no cellular radios to speak of. It's also around 11mm thick. The marquee feature of this low-end, moderately chunky (for 2013) disappointment of a tablet? The price: a surprising $169. The Slate 7 compares most closely with the Asus Nexus 7, and though the Nexus 7 is $30 more expensive, it has a much better processor, is thinner, has a better screen, and doesn't depend on HP for updates. The Slate 7 also compares well to the unreleased TouchPad Go tablet, though it had a better rear camera. And a better screen. And wireless charging. And an option for cellular integration. And webOS. Though in the TouchPad Go's defense, it was supposed to come out 18 months ago. If you're wondering if this new Slate 7 might be a tempting target for Open webOS porting, we have but one question to ask you: "With such pathetic specs, why bother?" There's a reason the Slate 7 will retail for $169, and that's because it's not that appealing of a tablet. It's likely the Slate 7 will be plenty open, if HP hasn't gone out of their way to lock it down, so putting Open webOS on it might not be that big of a leap (depending on the manufacturer of the processor and their receptiveness towards open source, that is). But as the WebOS Internals Twitter account pointed out today following the announcement, "With such 2010 specs, why would you bother?" Why, indeed. Our dear friend Phil from Android Central went hands-on with the Slate 7 at MWC, and while he found the specifications and screen of the tablet in person as underwhelming as we have from a distance, he was at least impressed by the industrial design, even if it is a bit on the chunky side (see: price). The Slate 7 is perhaps a look into where HP's industrial design would have taken webOS tablets had HP followed through on their commitment to webOS after purchasing Palm instead of canceling the hardware program in a fit of stupidity. And with that, we're not going to bother discussing the Slate 7 at any more length unless it for some reason is found to be running webOS. The tablet is due on shelves at US retail stores in April, which means we should expect it to be canceled around June anyway. As reported earlier this month, HP today pushed out the 2.2 update to the Enyo application framework, bringing full Windows 8, Windows Phone 8, and BlackBerry 10 support to the fold. While Enyo has offered support for Internet Explorer 10 apps since late November 2012, Enyo 2.2 now supports apps packaged for the Windows Store, including using Microsoft Visual Studio to do the packaging. As for Windows Phone 8 and BlackBerry 10, The Enyo Blog states that packaging Enyo apps for these platforms "is like packaging for other mobile platforms — you’ll need a native app container to run in," they recommend using Cordova. Enyo's platform-specific deployment documentation has been updated with more specific information for all three platforms. New operating system support isn't the only thing going on in Enyo 2.2. The framework has had a revamp of the enyo.List infinite scrolling list widget, gaining support for drag-and-drop reordering and swipeable items. Both work exactly as you expect, tap/click and hold and then drag to the new position, and swipe left or right on a list item to trigger whatever action the developer can code. The API docs have been updated to reflect the "highly customizable" nature of reordering and swiping with enyo.List. The team has put together a sampler that shows off both the reordering and swiping, and, well, it works. With support now enabled for every major mobile operating system, there are even fewer reasons now to not be using Enyo for cross-platform application development. 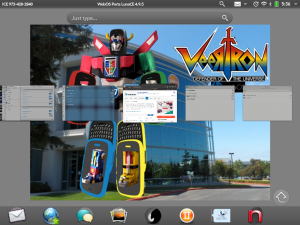 Windows 8, BlackBerry 10, iOS, Android, webOS, even Kindle Fire and all major web browsers are supported by Enyo 2.2. So, why not Enyo? Georgia and Rene are joined by WPCentral's Daniel Rubino, a former sleep technician, to discuss the importance of rest, relaxation, meditation, and... sleep! We talk about common sleeping problems, and offer tips and advice on getting better, healthier sleep. Join us! We've already talked a lot about what the talented folks that remain at HP working on webOS are doing, but with everything going on at HP, it's fair to ask if they've reevaluated their priorities. CRN sat down with HP CEO Meg Whitman and asked her what she was doing with the "remaining talent from the webOS team". As is typical of most CEOs discussing internal operations when things haven't gone as they were supposed to (and as with most of the answers given to the fifteen 'tough' questions CRN posed), Whitman was purposefully noncommittal and vague, going so far as to not even mention webOS in her answer. She said that "there is immense talent at HP, talent that may have been overlooked before" and that her "first choice" when adding personnel to part of the company "is to go find the talent inside HP". While that could be read as HP taking engineers and developers and the like and sending them to webOS or HP grabbing those employees from webOS and sending them elsewhere in the Palo Alto giant is an unknown (see paragraph two), we can't say we've heard of any mass movements into or out of the Sunnyvale offices of the webOS Global Business Unit/Gram. That hasn't stopped the folks at the webOS GBU from consistently and insistently hiring new people on board and actively even recruiting from outside the company, though there's a lot to fill after the post-shutdown exodus. The takeaway? HP is still a company in flux. They might have a shiny new executive center and Whitman might be well into her second year as HP CEO, but it's going to take a long time to get HP back on course following a year of the most extreme corporate dysfunction we've ever seen. Source: CRN; Thanks to Vistaus in the forums for the tip! News has been making the rounds today that HP was just last week issued a patent last week for the webOS user interface. Technically, this is correct, patent US8373673 B2 was granted and published on 12 February 2013. The patent was filed on 20 December 2011 - after HP announced plans to open source webOS - and bore the names of Daniel Shiplacoff, Matias Duarte, Jeremy Lyon, and Richard Dellinger. There's just one catch: this was a continuing patent application, as it says in the first line of the description. The original application (US 2009/0278806 A1) for the webOS user interface was filed on 6 May 2008. If you're doing the math, yes, more than eight months before the Palm Pre was unveiled at CES 2009. That application was followed up in more webOSy detail on 20 July 2009 with application US 2010/0185989 A1 - after the Pre had launched. That patent was granted and published on 17 April 2012 as US8159469 (well after HP had purchased Palm, revealed and launched the TouchPad, killed all webOS hardware that would use these patented interfaces, and started into the open sourcing process). We even discussed it in November of 2011, when we were digging the cool multi-level wave launcher for which we're still waiting. The 'news' of the most recent webOS user interface patent granting comes courtesy of Patently Apple (why are you guys putting your watermark on images you've pulled from a public patent application? ), who strangely said that this patent "breathes a little life into their various ongoing projects"… which makes absolutely no sense for an open source project. That's alright, we get it. Research is hard. LunaCE (pronounced "lunacy"), the homebrew update for the TouchPad by WebOS Ports is based off the Open Source "webOS Community Edition" released by HP (not to be confused with Open webOS). It contains a number of enhancements to the TouchPad, including those on how you are able to interact with open application when in card mode. You now have the ability to adjust the overlap level of cards in a stack and the zoom level of the cards, but LunaCE has also brought back a feature that used to exist in webOS 1.x but was removed in webOS 2.0: the mini card view! By tapping on the area below an open card or stack when in card view, the zoom level of the cards will adjust to allow you to see a mini view that will show up to 5 cards or stacks at once. Tap below the cards again and the apps will return to the normal zoom level. If you also have the "Card Zoom Gesture" tweak enabled, the mini-card mode will remember your custom zoom level and use that instead. Note that LunaCE is currently in beta so you will need to go through the process to set-up the beta feeds in Preware, which can be found at testing.preware.org. In addition, you will need to have Tweaks installed on your TouchPad to toggle this new feature. Once you have both of them installed, you just need to go to the "Luna" section of Tweaks and toggle "Enable Mini Cards" to YES in the "CARDS" section to activate this feature.